Today, it is nearly 4th of July in the USA, and my family is swimming in our warm 85 f swimming pool, in our sweet home, on a nice sized private lot in my hometown, prepping for having my mom and grandma over for 4th of July, and A MOVE BACK TO SWEDEN. We moved to Sweden 7/22/2008 and left on 9/11/2012. The last weeks got crazy, I ended up in the ICU for a group A strep infection on my leg, cut the road trip to Norway out of the plan and went straight home to Florida. I remember the Florida heat those first few days.... Sending kids out to play, and only being able to stand out there a few minutes before being soaked in sweat, having to run back in to the cool air conditioned air to escape the humidity and the heat. We stayed a week at my parents, then got a beach condo, and enjoyed some Florida pool and warm gulf water while we commenced a search for a job and a house. Our SwedeLife house sold, and we found we were in competition with investors for the residential properties in our little Florida town. Houses were being snatched up before making it to market, and we ended up renting next to some old friends. We thought that would be great, but soon learned families with school age kids are busy-busy-busy, and even being next door the children seldom had time to play. They were out at 8:30, back at 4:45, and had 15 minutes on the street before the 7 year old had to spend an hour on homework, then off to bed..... the house had problems that made us sick. We ended up moving into five places before we were able to find a home, and even then, we ended up with a house with major undisclosed problems. Returning was not what we hoped. Relationships had shifted while we were gone, baby friends had grown to busy school aged friends, moms once at home and ready to get together had gone back to other pursuits. The ready made circle of friends I expected to support me was no longer intact. It took sometime before I realized we needed to forge new relationships, and create a whole new life. It seems dumb, now, looking back that it took me so long to know there is no 'going home', but you are always making a new path. No one told me it is easier to be a stranger in a strange land, than a stranger in your own country. Two years after we returned, I found a blog that explained repatriation really well. When you leave your country of origin, it is like you leave a country of circles. You, a circle, go to a new country, where everyone is a square. You adapt and change under the influence of the squares, you stretch and your edges become different. You return back to circle country, and are no longer a circle. You are a little bit circle, a little bit square- a hybrid new shape, a triangle. What I know now I did not know then, was by leaving my country, I would never quite fit in either place ever again. It is interesting to realize the people who have become our friends since moving back are mostly people who are in cross cultural relationships or have lived internationally. We instinctively found we are now most at home with other triangles. A few of us who left Sweden at the same time, from Ireland, Australia, and USA all related very much to that post, that idea, nearly two years after we were back, and thought, yep, that really is how it is. We all saw our lives in the words, and felt like 'well, that would have been helpful to know!!" I came back just in time though. Part of returning was because of family health concerns, and though we had no way to know it at the time, we made it back in time to spend the last year of my father's life with him. We have been with my mom while she was very sick, grieving, and adjusting to some new medical treatments that now have her doing pretty well. Kids have done great settling into various programs we patched together: home schooling, home waldorf programs, charter schools, the public school I went to as a kid. Everyone has managed to get what they need. My husband got work in USA, I returned to being a part time self employed midwife while homeschooling. We have had a hard few years, and a lonely few years, and overall they were easier done here than there. We have finally gotten comfortable in the life we have built upon return. Then this spring, there was one particular moment when I thought "maybe we should go back to Sweden". I was with the homeschooling group for my 7 year old, my 5 year old also in tow, standing with half a dozen adults one Friday afternoon, watching our kids play on a pile of dirt. And as endearing as my children playing are, I thought, "I used to be able to let my kids play in piles of dirt and I did not have to personally supervise it, when we were in Sweden". After 11 years of parenting, I am feeling like I want to spend some time pursuing things that matter to me, and watching kids play in the dirt is not my current life dream. In so many ways, it has been great to spend these difficult years in USA where I could easily make new friends, participate in groups, and enjoy all the USA has to offer. Family. Life with my school aged daughter in English, and my culture has meant I can chaperone field trips, and understand the nuances of life. The abundant craziness of Trader Joe's and Whole Foods, shopping at the Dollar Store for Helium birthday balloons at 9pm, the glory of warm gulf water beaches and warm swimming pools. My mom. Setting up a facebook event for camping, and having a load of families sign up, and join us for a weekend in the woods. But these years were lonely, and full of grief, too. My dad got cancer and after five short months of treatment, died. Our house, now fixed, was bought with a load of undisclosed problems that cost us $50,000 and had us strip it down to the studs, and move in unfinished. If we leave this chapter of life behind us, I will welcome a fresh start. My husband can work here, there, anywhere. I am a Swedish citizen now, and while I speak basically NO Swedish, I can go to University tuition free and there are a load of English language Master's programs I am eligible for, and make a career change from 24-7 on-call clincal work to public health work. It has been exhausting to be an on call midwife again, and I am looking at ways to translate my passion for birth into a job in policy, so I can make birth better, but to also sleep at night, and have a regular schedule. I have applied for Master's programs in Sweden. We enrolled the kids in the Waldorf schools in our region. We are patching up the last fix it ups on our Florida home, getting it on the market, and getting ready to have a last holiday with family for 4th of July. We are crossing fingers all the moving parts will come together so we are back in Sweden for the start of the new school year. When we left in 2008, we said "let's give it three years and see how we are". We stayed 4 years. 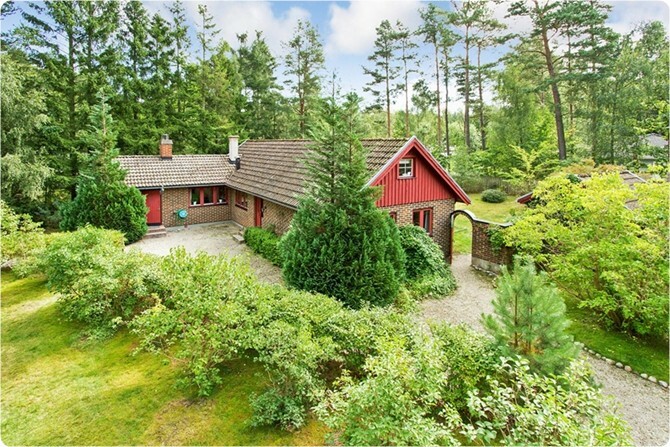 When we came back to USA in 2012, we said "Let's see if we can sell the Swedish house, and get a US job, and see if we can spend the stay at home toddler years in USA, where there are so many at home moms, then see how we are." It has been 4 years. Now in 2016, looking at school aged kids, my desire to get back to work and improve my professional prospects, weighing the value of family relationships on each side of the Atlantic, two sides of the family an ocean apart, two cultures we want our kids to know, we are looking to return to our Swede Life. Master's for me. Swedish language and culture for the kids. Play school for our little guy. Midsommar maypoles with my husband's clan, and the perks and hardships of Swedish life, things we know now we are in for. When we left before, I was starry eyed and unsure what we were heading for. It was 4 years in Sweden with two pregnancies and newborns. Now, it will be school for me, school for kids, and hopefully me finally learning Swedish. Now, I know what it means to be "a triangle", and will adapt more like the child of divorced parents who has to bounce between two households. Rules at mom's are different than the rules at dad's. Instead of comparing the two cultures I live in, I can just accept that USA has wonders and irritations, and Sweden has upsides and downsides, and know they are just different. I can just make the most of either place while there. So this 4th of July/ Independence Day, we are making plans for a Swede Life, once again. Now my dream life can be yours. Please help us find another home with character, wilderness, where the kids can play outside with nice neighbor kids. 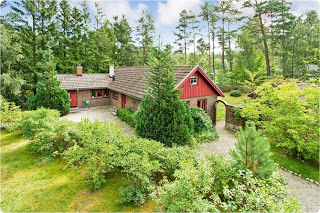 We have loved this magical home, and expect the next owners will too, but believe the best is yet to come! Thanks for The Swede Livin'. We are moving back to the USA, for a time, for good, who knows. But we have decided are leaving as fast as we can pack, to get out before school starts. At this point we think we will rent the house out, and hope for an eventual set up where we are part the year in Sweden, part the year in Florida. I apologize for not putting up more wonderful pictures of our last year in Sweden. Since the third baby came, life has been simply lived and not blogged about. Everytime I think I will just put up a few pictures I get overwhelmed, so many beautiful places, so many fun things in those photo files. In spite of the good times, fresh air, clean water, and Pippi adventures, we are going back to Florida for now. As lovely as Sweden is, I have felt a little like I was living at a high altitude when here. I am functioning at diminished capacity, like there is something missing that keeps me from really thriving. I am really looking forward to going back to where I understand everything and can participate fully in all parts of my life. It will be like getting fully oxygenated once again. Like they say.... We have gotten to know and helped with family, my kids are fluent in Swedish, we have all lived the Swede Life. We had two babies here. It has been good, and we are looking forward to seeing what life has in store for us next. Maybe we will be back, but for now, Cheers. More in support of the Swedish home schoolers, an article from July 27th edition of The Wall Street Journal on the new fusion education, Roam Schooling. I don't know how most people spend their second morning home schooling. I spent mine hyperventilating into a paper bag. After less than 24 hours of educating my child at home, I was struck by the realization that I wasn't up to the task and should move immediately to Plan B. Except I didn't have a Plan B. For two years leading up to this I had watched my daughter convince experienced, well-meaning teachers that she was incapable of mastering long division when, in fact, she simply didn't like long division. Alice's ploy raised a larger concern: At age 9, she appeared to be cruising along in school without actually doing any work. To my sorrow, it appeared I had given birth to myself, another pleasant slacker fated to a lifetime of successfully studying for midterms between classes until barely paying attention stopped working. Alice wasn't learning how to learn, she was learning how to coast. Maybe I could wait and see if she came to learning on her own. Or maybe she needed a different kind of education. Her father and I checked out a few middle-school programs known for their rigor. Each promised to challenge Alice academically but also promised hours of homework every night. I'm greedy. I want my child challenged, but I don't want her staying up until 2 a.m. every night translating "The Aeneid." I knew we had a small window of opportunity to teach Alice to love learning, but I also knew there was an equally small window for her to be a child. Her academic options seemed to lie on either side of a wide chasm: a fluffy pillow on one side, a jackhammer on the other. I tried home schooling because I couldn't find a better alternative. It turns out I'm not alone. Today in the U.S., some two million children are home schooled, growing at an annual rate of 7% to 15% for over a decade, according to the president of the National Home Education Research Institute. The term "home schooler" once implied "isolationist religious zealot" or "off-the-grid anarchist who makes her own yogurt." Today, it also means military parents who hate to see their kids keep changing schools; or the family with a future Olympian who ice skates five hours a day; or your cousin whose daughter is gifted but has a learning disability. The average home schooler is no longer a sideshow oddity. 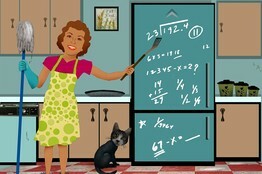 "I could never ever teach math," more than a few parents told me in horror at the very idea of home schooling. Or science. Or a foreign language. But mostly, it was math. Here's my secret: I can't teach math either. Once they start calling them integers instead of numbers, I recoil as from a fat, angry snake, which is why Alice takes an online math class, with great lashings of help from her father. But the biggest thing people want to talk about is socialization. Everyone is worried that I keep my child in a crate with three air holes punched in it and won't let her have friends until she gets her AARP card. There's a long answer, of course, but I'll sum it up this way: Homo sapiens have walked the Earth for at least 130,000 years and, in this time, they learned to be human from their elders, not from their peers. Mandatory education in the U.S. is less than 150 years old. Learning to be a productive adult human by spending a third of every day with other kids might be a good idea, but it's too soon to tell. I'm still unsure that the people best equipped to teach a 14-year-old boy how to be a man are other 14-year-old boys. 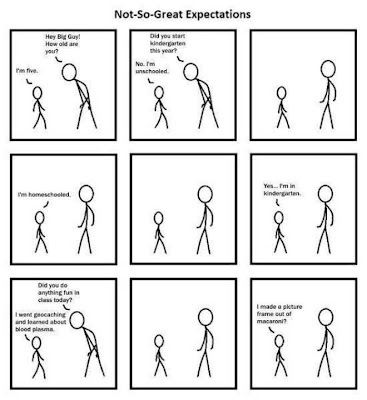 In fact, home-schooled kids are just as socialized as other children. They certainly seem to grow up to be, and feel, fully engaged. One study, by a Canadian home-schooling group, found that 67% of formerly home-schooled adult respondents said they are "very happy," as opposed to the general population's 43%. Another study, published in the Journal of College Admission, found that home-schooled students perform better on their ACTs, have higher college GPAs and are more likely to graduate in four years. As we approached the end of our first year home schooling, we asked ourselves whether Alice should continue the experiment or return to what many of our friends still call "real school." At this point it no longer seemed to us like a binary decision. It was less a matter of either/or than of how-much-of-each. I suspect that many Americans will reach the same conclusion as they adapt to new social and economic realities. Online classes have already become part of an extended curriculum for many students. In the iTunes version of public education, relevant learning experiences will originate from the large redbrick building down the street, from a recreation center downtown, from a music studio in Seattle or a lecture hall in London. As our habits evolve, it won't be home schooling as we've known it, but it won't be brick-and-mortar schooling, either. I call it "roam schooling." Imagine that your high-school junior spends half of every day at the brick-and-mortar school up the street. Two afternoons a week, he logs into an art-history seminar being taught by a grad student in Paris. He takes computer animation classes at the local college, sings in the church choir and dives at the community pool. He studies Web design on YouTube. He and three classmates see a tutor at the public library who preps them for AP Chemistry. He practices Spanish on Skype and takes cooking lessons at a nearby restaurant every Saturday morning. Is this home schooling or regular school? Who cares? He's learning. More important, his curriculum hits the basics but also works for him. Nobody expects all young people to download the same 20 or 30 songs on iTunes. Why should they be limited to the same dozen or so classes for school? And if you think that public education will never change because it's too big, I'd point out that the music business looked like an invincible Goliath before digital technology raised its slingshot. Some lessons are best learned at a kitchen table, others in a lecture hall, a chemistry lab or a gym. It would be nice if students everywhere had access to every option, and more of them will, I expect, over the next decade. With each passing year, the division between home schooling and institutional schooling will continue to dissolve. We will go to the education, and the education will come to us. The bad news is that it doesn't work that way yet. The good news is that we get to build it. 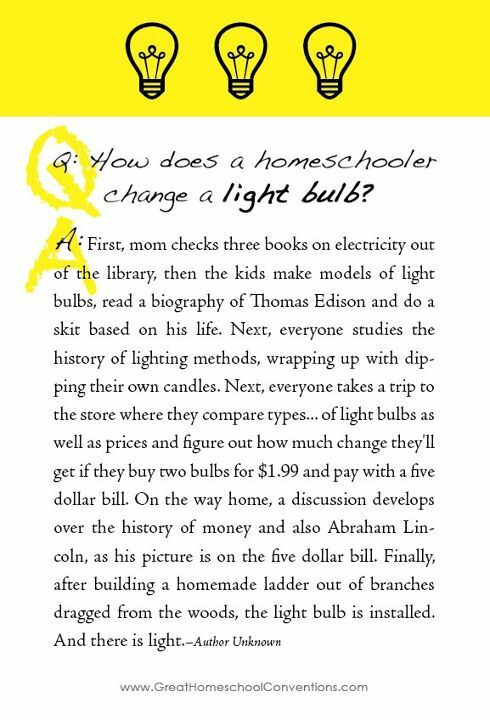 —Adapted from Ms. Cummings's "The Year of Learning Dangerously: Adventures in Homeschooling," which will be published on Aug. 7. Follow her on Twitter: @quinncy. A version of this article appeared July 28, 2012, on page C2 in the U.S. edition of The Wall Street Journal, with the headline: My Education inHome Schooling. 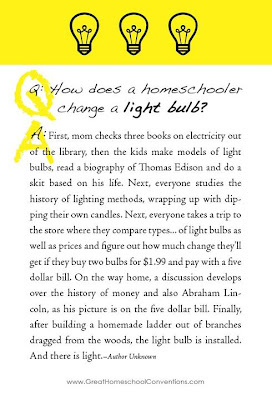 How does a homeschooler change a light bulb? Like many critics, I used to feel vaguely sorry for home-schooled kids. What a shame, I thought, that they might be deprived of the well-rounded education and social skills to become integrated, productive members of society. I never thought to question why cafeteria food fights or the predatory pack habits of teenage girls would be better for molding productive members of society. This uninformed, critical opinion lasted precisely until I met my first home-schooled children several years ago. Within one month I met five home-schooling families, and their 13 children were among the most polite, well-adjusted, socially adept and academically advanced kids I'd ever seen. Being home-educated seemed to have given them a confidence and maturity — and yes, social skill — far beyond their years. They had many friends, but didn't seem dependent on their peers for approval — a far cry from what I remember as a kid. 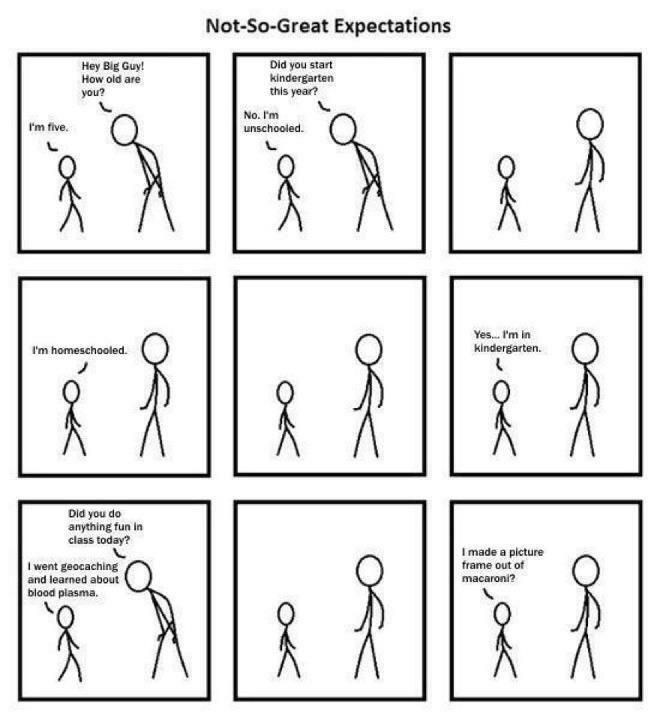 I've since learned that these kids were not the home-schooling exception but the rule, which makes me wonder how anyone could look at the data and say it deprives kids of anything. In a landmark study by Dr. Brian Ray of the National Home Education Research Institute, among 7,000 young adults who had been home-schooled, 74 percent had attained some college courses, compared with just 46 percent of other young adults — and 82 percent said they would home-school their own kids. On the social front, almost twice as many home-schooled adults as those in the general population were active in their community (71 percent to 37 percent) and "very happy" with life (59 percent to 28 percent). In 1998, a Home School Legal Defense Association's study of 20,760 home-school students found that: "In every subject and at every grade level (on standardized tests), home-school students scored significantly higher than their public and private school counterparts." Younger home-schoolers performed one grade level higher than their public and private school counterparts, and by eighth grade, "the average home-school student performs four grade levels above the national average." Obviously, home education doesn't fit every family. But the evidence makes me think it's the kids who aren't home-schooled who may be missing out, not the other way around. A recent article in the New York Times "Home Schoolers Do Not Just Stay Home" gives a picture of what modern home schooling looks like in practice, and how museums across the USA have developed programs for home schoolers.